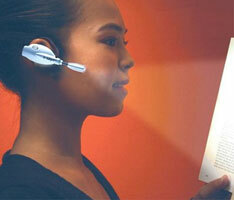 The Over-Ear Book Light is simply that, an over the ear, Bluetooth-style headset that is just a flashlight. It is a little less discreet that most personal book flashlight, but it aims wherever you are looking. So, lets say you are trying to read Everybody Poops inconspicuously, but coincidentally your partner rips one and you look over, suddenly they will be blinded by the flashlight and wake up to see you reading some inappropriate literature. It's your own fault for trying to secretly read Everybody Poops to begin with. The Over-Ear Book Light is available for $25. Nice invention, and you can even wear it in public to look like a trendy Bluetooth headset wearer.